Interface characterization and control are critical in the design and manufacture of high quality advanced materials, particularly, for nanomaterials. This proceedings features papers on interface science and technology that provide a unique and state-of-the art perspective on interface characterization and control. Articles from scientists and engineers from 11 different countries address interface control, high temperature interfaces, nanoparticle design, nanotechnology, suspension control, novel processing, particulate materials, microstructure, and hot gas cleaning. This unique volume will serve as a valuable reference for scientists and engineers interested in interfaces, particulate materials, and nanotechnology. Proceedings of the International Conference on ICCCI 2003, Kurashiki, Japan, 2003; Ceramic Transactions, Volume 146. Kevin Ewsuk is the editor of Characterization and Control of Interfaces for High Quality Advanced Materials, published by Wiley. Kiyoshi Nogi is the editor of Characterization and Control of Interfaces for High Quality Advanced Materials, published by Wiley. Markus Reiterer is the editor of Characterization and Control of Interfaces for High Quality Advanced Materials, published by Wiley. Antoni Tomsia is the editor of Characterization and Control of Interfaces for High Quality Advanced Materials, published by Wiley. S. Jill Glass is the editor of Characterization and Control of Interfaces for High Quality Advanced Materials, published by Wiley. 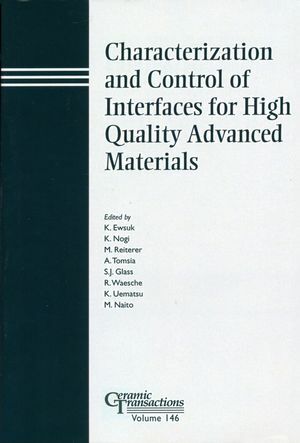 Rolf Waesche is the editor of Characterization and Control of Interfaces for High Quality Advanced Materials, published by Wiley. Keizo Uematsu is the editor of Characterization and Control of Interfaces for High Quality Advanced Materials, published by Wiley. Makio Naito is the editor of Characterization and Control of Interfaces for High Quality Advanced Materials, published by Wiley. Nanoparticle Design and Suspension Control. Supercritical Hydrothermal Synthesis of Nanoparticles (T. Adschiri, S. Takami, M. Umetsu, S. Ohara, T. Tsukada). Production of Ordered Porous Structures with Controlled Wall Thickness (Y. Hotta, K. Watari, P.C.A. Alberius, L. Bergstr&ouml;m). Control of Dispersion Characteristics of TiO2 Nano-Powders for Electronic Paper (S.H. Kwon, J.H. Ahn, Y.I. Cho, W.S. Hong, S.J. Kim). Direct Force Measurements of Ceramic Nanoparticles in Liquid Media (J.-M. Cho, W.M. Sigmund). Direct Force Measurements Between Zirconia Surfaces: Influence of the Concentration of Polyacrylic Acid, pH, and Molecular Weight (J. Sun, L. Gao, L. Bergstr&ouml;m, M. Iwasa). Effects of Polymer Dispersant Molecular Structure on Nonaqueous Ceramic Suspensions (T. Kakui, H. Kamiya). Influence of the Molecular Structure of a Polymer Dispersant on Concentrated SiC Aqueous Suspensions (K. Sato, M. Hasegawa, T. Kakui, M. Tsukada, S. Omi, H. Kamiya). Synthesis of TiO2 Nano-Powders from Aqueous Solutions with Various Cation and Anion Species (Y.-I. Cho, S.-C. Jung, D-S. Hwang, S.-J. Kim, N. Makio, K. Nogi, K. Uematsu). Characterization of Nano-Particle Dispersion in a Silica Slurry (C. Takai, M. Fuji, M. Takahashi). Effects of Slurry Preparation Conditions on Granule Properties and the Strength of Alumina Ceramics (M. Furukawa, T. Hotta, K. Okamoto, H. Abe, M. Naito). Effects of Titanium on Wettability and Interfaces in Aluminum/Ceramic Systems (N. Sobczak). Interface Phenomena and Wettability in the B4C/(Me-Si) Systems (Me=Cu,Au,Sn) (N. Froumin, M. Aizenshtein, N. Frage, M.P. Dariel). Interfacial Reactions Between Metals and Ceramics at Elevated Temperatures (J.E. Indacochea, S.M. McDeavitt, G.W. Billings). Intrinsic Wettability and Wetting Dynamics in the Al/á-Al2O3 System (P. Shen, H. Fujii, T. Matsumoto, K. Nogi). Wetting in the Tin-Silver-Titanium/Sapphire System (L. Gremillard, E. Saiz, A.P. Tomsia). Tensile Properties of a Friction Stir Welded Thin-Sheet of 1050-H24 Aluminum Alloy (H.J. Liu, H. Fujii, K. Nogi). Surface Tension of 304 Stainless Steel under Plasma Conditions (H. Fujii, T. Misono, T. Matsumoto, K. Nogi). The Effect of Minor Elements in Argon Shielding Gas on Convection in a Molten Weld Pool (H. Fujii, Y. Morikawa, M. Kamai, K. Nogi). Characterization of a Photocatalyst Prepared by a New Method to Introduce Ti Sites on the Surface of Silica (M. Fuji, M. Takahashi, N. Maruzuka, T. Takei, M. Chikazawa). Particle Oriented Bismuth Titanate Ceramics Prepared in a Magnetic Field (A. Makiya, D. Kusano, S. Tanaka, N. Uchida, K. Uematsu, T. Kimura, K. Kitazawa, Y.Doshida). Formation of Nanostructure Composites Using Advanced Mechanical Processing (D. Tahara, Y. Itoh, T. Ohmura, H. Abe, M. Naito). Synthesis of AlN by Gas-Reduction-Nitridation of Transition Alumina Powder (T. Yamakawa, J. Tatami, T. Meguro, K. Komeya). Effects of á Phase Content on the Sintering Behavior of Si3N4 Powder (R. Nishimizu, J. Tatami, K. Komeya, T. Meguro, M. Ibukiyama). Fabrication, Microstructure, and Corrosion Resistance of â-Sialon Nano-Ceramics (Q. Li, K. Komeya, J. Tatami, T. Meguro, M. Omori, L. Gao). Characteristics of Dehumidifier Sheets for an Adsorptive Desiccant Cooling System (Y. Tashiro, M. Kubo, Y. Katsumi, T. Meguro, K. Komeya, J. Tatami). Development of New Materials by Mechanical Alloying (J.M. Torralba, E. Ruiz-Navas, J.B. Fogagnolo). Magnetic Properties of Ni-Ferrite Produced by High Energy Milling (M.E. Rabanal, A. Várez, B. Levenfeld, J.M. Torralba). Centrifugal Pressure Assisted Diffusion Bonding of Ceramics (Y. Kinemuchi, K. Watari, S. Uchimura). Formation of Interfacial Phases at a SiC/Cu Joint Friction-Bonded with Ti (A. Nishimoto, K. Akamatsu, M. Takahashi, K. Ikeuchi, M. Ando, M. Aritoshi). An Aerosol Deposition Method and its Application to Make MEMS Devices (J. Akedo). Morphology and Performance of a Ni-YSZ Cermet Anode for Solid Oxide Fuel Cells (T. Fukui, K. Morata, H. Abe, M. Naito, K. Nogi). Fuel Cell Technology in Thailand (P. Aungkavattana, S. Charojrochkul, H. Mahaudom, A. Kittiwanichawat, W. Wattana, M. Henson, S. Assabumrungrat, S. Srichai, S. Kuharuangrong, J. Charoensuk, W. Khan-ngern, P. Khamphakdi, N. Nakayothin). Electrophoretic Deposition of a High Performance La(Sr)Ga(Mg)O3 Electrolyte Film for a Low Temperature Solid Oxide Fuel Cell (M. Matsuda, O. Ohara, M. Miyake, K. Murata, T. Fukui, S. Ohara). Formation of MgB2 Superconducting Phase from Mg and B Composite Particles Produced by Mechanical Mixing (H. Abe, M. Naito, K. Nogi, S. Ohara, A. Kondo, T. Fukui, M. Matsuda, M. Miyake). Microstructure and Mechanical Properties of AlN Ceramics with Y2O3 (S. Iwasawa, J. Tatami, K. Komeya, T. Meguro). Microstructure of AlN Fibers Synthesized from Al2O3 by Gas-Reduction-Nitridation (Y. Matsumoto, J. Tatami, T. Meguro, K. Komeya, T. Yano). Sintering Behavior of AlN (J. Tatami, K. Komeya, T. Hoshina, T. Hirata, T. Meguro, A. Tsuge). Characterization of Internal Interfaces in Translucent Polycrystalline Alumina (G.C. Wei). Joining of Si3N4 to a Nickel-Based Superalloy Using Active Fillers (S.P. Lu, Y. Guo). Fabrication of Grain Refined 7475 Al Alloy Foils Utilizing RF Magnetron Sputtering (T. Shibayanagi, M. Maeda, M. Naka, D. Watanabe, Y. Takayama). Analysis of Ash Adhesion Behavior at High Temperature Conditions - Relationship Between Powder Bed Strength and Microscopic Behavior (M. Tsukada, H. Yamada, H. Kamiya). A Report on Coal Gasification Technology that Includes a Synthetic Clean-Up System (S. Wasaka, J. Suhara). Ash Particle Formation and Metal Behavior During Biomass Combustion in Fluidized Bed Boiler (E.I. Kauppinen, J.K. Jokiniemi, T. Ling, J. Latva-Somppi). An Overview of Silica Dust Pollution and Controls (H. Qi, C. You, Y. Bao). Characterizing and Modeling Filtration in a Granular Coke Bed (M. Furuuchi, C. Kanaoka, M. Hata, Y. Kawaminami, R. Takahashi, J. Yagi, R. Takehama). Direct Measurement of the Adhesion Force for Single Ash Particle at High Temperature (H. Kamiya, T. Aozasa, M. Tsukada, H. Matsuda, H. Makino). Development of a Regenerable Desulfurization Sorbent for Hot Coal-Derived Gas (M. Nunokawa, M. Kobayashi, H. Shirai). SiC-Coated Diamond Synthesis and Properties in Diamond Dispersed Cemented Carbides (Y. Miyamoto, Y. Morisada, H. Moriguchi, K. Tsuduki, A. Ikegaya). Structure of the Interface in SiC-Based Ceramic Composites Formed by Tribo-Oxidation Under Dry Sliding Conditions (R. Wäsche, D. Klaffke, M. Woydt, I. Dörfel). Contact Damage Behavior of TiN-Coated Si3N4 Ceramics (S. Suzuki, J. Tatami, K. Komeya, T. Meguro, A. Azushima, Y.-G. Kim, D.K. Kim). Effects of Interface Control on the Formation and Properties of Carbon Nanotubes Composites (L. Gao, L. Jiang, J. Sun). Composite Powders Synthesis by Spray Pyrolysis (S. Ohara, M. Umetsu, S. Takami, T. Adschiri, M. Itagaki, J.-H. Lee, H. Abe, M. Naito, K. Nogi, T. Fukui). Aerosol Synthesis and Phase Development in Ce-Doped Nanophased Yttrium-Aluminum Garnet (Y3Al5O12:Ce) (O. Milosevic, L. Mancic, S. Ohara, G. del Rosario, P. Vulic). Phase Evolution in Ag:(Bi,Pb)2Sr2Ca2Cu3Ox Composite Powder (L. Mancic, Z. Marinkovic, B. Marinkovic, P.M. Jardim, F. Rizzo, O. Milosevic). Nanotechnology - From Promising to Practical: The Role of Standards (S. Freiman). Nano-Sized Hydroxyapatite Crystals Grown in Phase Separated Microenvironments (K. Sato, Y. Hotta, Y. Kinemuchi, K. Watari). Reduction of Thin Film Surface Roughness by Self-Assembling of Organic Molecules (M. Itoh, K. Aota, R. Sugano, H. Takana). The synthesis of NiO-CGO Powder, and the Processing and Properties of NiO-CGO Anodes (E. Suda, B. Pacaud, M. Itagaki, S. Ohara, Y. Montardi, Y. Takeda).